To most Americans, spending winter months in the Twin Cities might seem daunting. But for the resilient residents of Minneapolis/St. Paul, it's a grand opportunity to go ice skating on an actual outdoor rink or deeply frozen pond or lake, go sledding or snowboarding, have snowball fights, or go cross-country skiing. Winter events and festivals abound with parades and hockey games to look forward to. And that's just the outdoor activities. There are also the après outdoors pleasures like snuggling up in front of a warm fire that burns all day and drinking hot toddies or hot chocolate. The serene and snowy landscape outside the window, dotted with evergreens and sparkling in the sunlight, is the very definition of peace. And, on those super-frigid days, there are plenty of indoor activities for the whole family. We have a whole range of ideas on fun stuff to do indoors and outdoors in the winter in the Twin Cities. Where there are snow and ice, there is an activity to match. Try cross-country skiing in one of the urban parks or even on a golf course. Theodore Wirth Park in Minneapolis has 25 kilometers of trails for beginners to advanced and a two-kilometer lighted trail for evening skiing. Columbia Golf Course in Minneapolis has several miles of trails. Fort Snelling State Park has 12 miles of scenic trails with river views. Como Park in St. Paul has some of the best trails in the Metro area. Minnesota Landscape Arboretum is a very scenic place to ski. Lebanon Hills Regional Park in Apple Valley and Eagan has some of the best local trails. Elm Creek Park Preserve in Maple Grove has several lighted trails, and snowmaking to keep the trails in perfect condition. If you're not one to get out on skis yourself, you can enjoy the City of Lakes Loppet, a cross-country skiing festival, with races and a torchlit event through Minneapolis in February. Ice fishing is on a Minnesota lake is as simple as layering up in warm clothes, grabbing a fishing pole (or spear) and using a hand-auger to make a hole in the ice. Of course, you can go to a resort and join others on the ice or hire a guide. But, for those in the know, ice fishing is pretty simple. If you can go fishing in the summer on a lake near Minneapolis, you can rest assured you can do the same thing in the winter. Every winter, the Minnesota Department of Natural Resources hosts "Take a Kid Ice Fishing Weekend." Residents can fish without a license when accompanied by a child age 15 or under. Select state parks provide all the gear and coach families through everything from drilling holes to preventing them from freezing over. The Winter Carnival, held in St. Paul in late January and early February, is the major winter event in the Twin Cities. The Winter Carnival features ice and snow sculptures, traditional Minnesotan foods, and a grand parade through downtown St. Paul. There's not just one parade. There are three. The Moon Glow Pedestrian Parade kicks off the first day of Carnival, beginning at 6 p.m. in downtown Saint Paul. Walkers, most with luminaries in hand to light the way, will be accompanied by hot air balloons which will help keep everyone warm. During the Grand Day Parade on the first Saturday of Winter Carnival, the newly crowned King Boreas will parade through the streets of St. Paul. Enjoy the dozens of marching bands, floats, and other festive sights. And then there's the Vulcan Victory Torchlight Parade. The evening parade route starts at 5th and Wacouta and ends at Saint Peter Street in Rice Park. The parade and traditional skit are followed by a fireworks show. Most events are free, open to the public, and will take place in downtown Saint Paul, near Rice Park and Landmark Center, as well as at the Minnesota State Fairgrounds. The Holidazzle events with lights and music run from Thanksgiving until Christmas in downtown Minneapolis. Holidazzle is a Minneapolis tradition, and you can expect a Minneapolis-centric experience that includes well-known local businesses and products. Enjoy prepared food and beverages, packaged food, merchandise, free music and other festive entertainment for all ages. Holidazzle brings family-friendly programming to Loring Park and everything is completely free. Have some fun at bowling alleys like Memory Lanes and Bryant Lake Bowl, where the hipsters and "Big Lebowski" fans go or neighborhood places like the ancient RanHam Bowling Center, which offers cheap bowling and is in the basement of the same building as The Nook Bar, home of the best Juicy Lucy burger (a cheeseburger with the cheese inside the meat) in St. Paul. Local roller derby teams Minnesota RollerGirls and North Star Roller Derby skate and gives each other black eyes for your entertainment all winter long. With names like Banger Sisters, Delta Delta Di, Kilmore Girls, and Violent Femmes you can envision what the derby is all about. If you've never seen roller derby, it's all-female, all-out war on roller skates and not for the faint of heart. The Great Lakes region has long been a major player for American beers, but Minneapolis is quickly gaining prominence as one of the best places in the United States to find a great, small-batch brew. From brewpubs to beer halls, more and more restaurants are choosing to fill their taps with only small-batch, locally brewed beers. If you're looking to sample the best of what area breweries have to offer, check the Minneapolis/St. Paul craft beer scene. Take a free brewery tour at the Summit Brewery in St. Paul on selected Saturdays, the Surly Brewery in Brooklyn Center on selected Friday nights, and monthly tours of Flat Earth Brewing Co. in St. Paul. Bundle up, get a thermos of hot cocoa, and drive around looking at holiday lights. 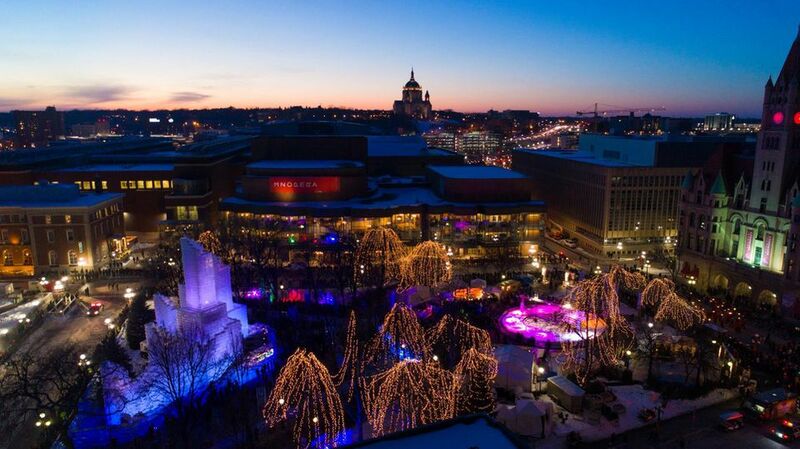 Minneapolis-Saint Paul has several great venues full of seasonal cheer and decorations—from Downtown St. Paul's Wells Fargo Winterskate at Rice Park to the Bentleyville Tour of Lights in the northern city of Duluth. There are some individual homes and neighborhoods full of the Christmas spirit too. Visiting museums is a great idea for those days when it's just too frigid to do things outdoors with your kids. The Minnesota Children's Museum is a wonderful interactive museum in downtown St. Paul dedicated to entertaining and educating children. It is a large museum with lots to see and do for kids from about 3 years old to 10. There are several permanent galleries at the Minnesota Children's Museum, and one or two traveling exhibitions. The U.S. Pond Hockey Championships are held at Minneapolis' Lake Nokomis every year in late January. The event brings thousands of players and fans together for ​a weekend of fun and fierce competition. This is a uniquely Minnesotan sport. In downtown Minneapolis, you can walk from building to building without braving the cold air. Pick a downtown hotel that has access to the Skyway System. The system connects corporate offices, bars, restaurants, bakeries, hotels, government services, retail, gyms, grocery stores, liquor stores, banks, doctors, dentists, masseurs, pharmacies, hair and nail salons, dry cleaners, live theaters, three pro sports facilities, a church, art exhibits, and the list goes on. Monday - Friday 6:30 a.m. - 10 p.m.
Saturday - 9:30 a.m. - 8 p.m. Since skyways are owned independently, hours may vary section to section. Minneapolis/St. Paul is home to both professional sports teams and collegiate sports. There is basketball, football, baseball, ice hockey and soon, professional soccer. The Twin Cities have been an epicenter of the U.S. stadium-and-arena boom, constructing five major sports facilities since 1990. The stadiums are co-located in the downtown area and you can walk from one to the other. The Twin Cities are readying for a sixth stadium, Allianz Field, a 20,000-seat, $150 million Major League Soccer stadium located in St. Paul about halfway between the two downtowns. The Minneapolis Institute of Art (Mia) is an art museum that has permanent exhibits and hosts traveling exhibitions such as "Egypt's Sunken Cities." Free one-hour public tours are offered daily. Topics range from special exhibitions to treasures of Mia’s permanent collection. There are free monthly Family Day events and spaces for children. Admission is free but there may be a charge for special exhibits. The Minnehaha Falls are a 53-foot tall waterfall in Minnehaha Park. Minnehaha Creek flows through Minneapolis and on the way, the creek plunges over an unexpected precipice creating Minnehaha Falls. It's one of Minneapolis' most popular parks in the summer, and worth a visit in the winter​ when the falls freeze into a dramatic wall of ice. First Avenue is a Minneapolis icon. Once the downtown Minneapolis Greyhound bus depot, the building was remodeled into a live music venue. The place has a great atmosphere. Prince played there in the early days of his career. Now, major pop, rock, and indie music acts perform at First Avenue. A photograph with the wall of stars in the background is a must-do souvenir of Minneapolis. Minneapolis' origins were as a mill town, first processing timber, and then becoming the largest flour-producing city in the nation in the late 19th and early 20th centuries. You can see a glimpse of that time at the Mill City Museum on the bank of the Mississippi in downtown Minneapolis. The Minnesota Historical Center took charge of the remains of the building after it burned and a museum was built inside the ruins. This is one of the best places to experience the history of Minneapolis. When you visit Minneapolis you'll hear about the Juicy Lucy Burger. Its a delicious burger with the cheese in the middle of the meat. The Juicy Lucy—also known as a Jucy Lucy—was invented sometime in the 1950s by either the 5-8 Club, or Matt's Bar, both in south Minneapolis. The rivalry between the two bars who both claim to have invented the Juicy Lucy adds to the appeal. Visit their websites and you'll notice that the burgers are featured prominently—with hot cheese flowing from the middle of the burger. Mall of America is the place to go for big-time shopping. It's the biggest mall in the country and one of the largest in the world. There are hundreds of shops and stores, restaurants, a theme park, an aquarium, and a wedding chapel. Minnesota has no sales tax on clothing so it's a common destination for out-of-state travelers who stock up on a whole season's wardrobe before flying home. In winter, city parks become places for snow play. St. Paul has more hills than Minneapolis. Minneapolis has two designated sledding spots, while St. Paul has 15. While the local terrain is mostly flat, there are plenty of fun hills in St. Paul, Minneapolis, and all around the metro area, most of them in city parks. Even in the winter, the horse-drawn carriage tours are out. Bundle up and enjoy the sights. The Hitching Company offers a one-hour Mississippi River Grand Carriage Tour or a half-hour Mississippi River Carriage Tour. Both tours take you by famous Minneapolis landmarks like the Minneapolis skyline and Nicollet Island. You can take a narrated ride or a quiet romantic trip through the streets of Minneapolis. What Are the Best Indoor Mini-Golf Courses in Minneapolis-St. Paul?